clients over the past years. If you're not satisfied with a moderate hill walk then a mountain scramble is for you. We say it's somewhere between a hill walk and a beginners climbing session although for those who like something a little more extreme we have mountain scrambles with that little extra!!! have scrambles of all grades from easy scrambles to hard scrambles throughout the Lake District and Cumbria including, Coniston, The Langdale Valley, Ullswater and Keswick to name just a few. Your mountain scramble will start off with a safety brief and then after kitting up with helmets it's off for an easy warm up before we start the ascent proper. Group hill scrambling trip in Coniston, Lake District, Cumbria uk. 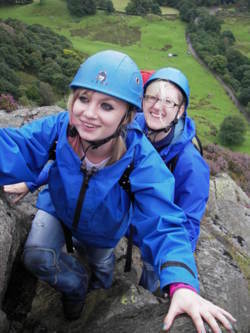 Mountain and hill scrambling is great on its own or as part of a full days activities.